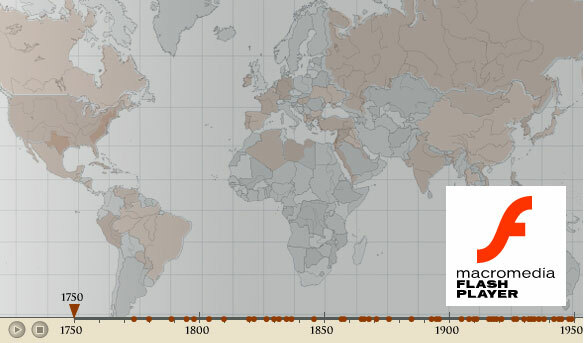 To view the Global Revolution map you need the free Macromedia Flash Player, version 6 or higher. The American and French Revolutions were fought several years and an ocean apart. However, they feature enough similarities that some people initially consider them “mirror struggles.” After all, there are some easy comparisons: both revolutions occurred in the later eighteenth century. Both subverted an existing, monarchical government. Finally, both created ripe conditions for constitutionalism and deep patriotism. But dig more deeply, and you’ll find that this “same revolution, different continent” concept is not as tidy as it initially appears. Further similarities between the two revolutions are just different enough to produce profound distinctions between the two revolutions. Although most scholars believe that the two revolutions influenced one another (as well as had profound worldwide impact), each revolution is a very distinct and singular struggle for freedom, identity, and an improved way of life. Both the American Revolution and the French Revolution were borne of dire economic conditions. Economic challenges definitely contributed to the basis for both revolutions. However, each nation’s money-related woes were quite unique. The American Revolution had roots in the financial pressure that Britain placed on the New World; because Britain was economically dependent on the colonies, it kept taxing them. However, the colonists didn’t oppose the taxation itself. They were more vexed by the lack of a reasonable basis for the taxation, feeling that they received little or no benefit from their funds that were being spent “back in the old country.” This phenomenon—commonly known as taxation without representation—infuriated the colonies, building the basis for their revolt. Classic images of hungry, poverty-stricken French peasants are still familiar. Indeed, the pre-revolution French economy was dismal and had been for decades. As a second-tier trading nation, France was unable to pay off national debts using the scant amount of money it received on the taxes for traded goods. To make up for this deficit, the King imposed further taxes, especially on the peasants. Paradoxically, the wealthiest nobles were not obligated to pay taxes. This allowed the King to successfully sell titles, pulling the two social classes further apart. So although the British tax-related woes were also tied to royal greed and exploitative control, they were relatively common to any new colonist establishment. France’s case, while certainly tax-related, was more deeply rooted in a historic division of social class. Although the rich and poor had long been separated, the King’s selling of titles totally isolated the two groups. This resulted in famine and extreme poverty for the lower classes, and left them no choice but to revolt. Both revolutions were undertaken with the goal of independence in mind. The American Revolution was not initially or even primarily fought for independence. Independence almost became a “by-product” of the colonists’ initial attempt to remove unfair taxes levied on them by British Parliament. On the other hand, France’s decades of class division and its burgeoning interest in thinkers like Rousseau (who emphasized the importance of human rights) sparked a popular interest in a more independent way of life. The influence of speeches, articles, and pamphlets from gifted writers and orators like revolution leaders Jacques-Pierre Brissot and Maximillien Robespierre also fueled this desire for freedom. Finally, the success of the American Revolution (and the colonists’ resulting independence from British rule) arguably acted as an incentive for revolt. Both revolutions spurred a strong response from the other nation. Before 1789, most people (excluding the Americans of the new United States) lived with the general form of government their ancestors had known for centuries, usually hereditary monarchy. After the French Revolution began in 1789, no form of government could be accepted as legitimate without justification. The revolutionaries established a republic in 1792, and henceforth republicans around the world would challenge monarchists. Overall, the French Revolution offered the world something totally novel: an ideology that allowed and encouraged the questioning of historic power structures. This ideology borne of the French Revolution laid the groundwork for other ideologies, including nationalism, socialism, and eventually communism. In fact, early communist leaders Karl Marx and Friedrich Engels both commented extensively on the French Revolution, hoping to find important lessons for building and governing communities. North Americans showed special interest in the French Revolution, believing the events of 1789 drew heavily on their own experience with Britain. The French Declaration of the Rights of Man and Citizen seemed to borrow strikingly from the states' bill of rights. Even more direct influence took place when American Thomas Jefferson, resident in France at this time, passed along specific ideas to the legislators through the Marquis de Lafayette. Although the French Revolution took a far different path than the North American variety, this interaction was close, so it is not surprising that the initial U.S. reaction to the French Revolution was positive. Not all Americans approved of the France’s methods. For example, John Adams declared his early and ongoing disapproval, and the Federalist Party’s support began to waver toward the Revolution’s end. The Reign of Terror also did little to create American approval and drew criticism from some prominent American statesmen. However, the Jefferson-led Republican Party remained largely supportive throughout most of the revolutionary decade. Both revolutions produced similar and seminal political documents. The Declaration of the Rights of Man and of the Citizen was adopted in France in August 1789 by the National Constituent Assembly. Drafted by the Marquis de Lafayette, it was intended as part of a transition from an absolute to a constitutional monarchy, and presented the ideas of popular sovereignty and equal opportunity. This document, which defined a set of universal individual and collective rights, was to be considered valid in all times, in all places, for all people. This novel way of thinking totally contradicted the traditional French idea of people being born into a nobility or into another favored class. It also eliminated the concept of people enjoying or being denied special rights based on family lineage of status, which clearly dismantled centuries of French ruling structure. The principles outlined in the Declaration sprung from the theories of philosopher Jean-Jacques Rousseau and other Enlightenment thinkers. However, the French Declaration is at least partly inspired by the declaration of Human Rights contained in the U.S. Declaration of Independence, adopted on July 4, 1776, and on the Virginia Declaration of Rights, developed by American George Mason in June 1776, which was itself based on the English 1689 Bill of Rights. The Declaration of the Rights of Man also showed similarities to the United States Constitution (1787) and the United States Bill of Rights, which was adopted in 1789, at approximately the same time as the Declaration of the Rights of Man. Like the U.S. Constitution, The French Declaration provided for a national defense, and emphasized equality before taxation (which was distinctly different from traditional France, in which the Catholic Church and the nobility were exempt from most taxes). Like these American documents, France’s Declaration prohibits ex post facto application of criminal law and proclaims the presumption of innocence to a crime suspect. Finally, the Declaration of the Rights of Man and the Citizen provides for freedom of speech and of the press, and addresses freedom of religion. The Declaration departs from seminal American documents in some important ways. It’s vital to note that the Declaration is largely individualistic. It focuses less on the rights of a political or religious group and more on the singular citizen, thus straying from America’s “we the people” stance. The Declaration also fails to address the freedom of assembly, liberty of association, or the right to strike, which were important American tenets.